Which Monk spec(s) do you intend to play? Personally, I will go for a Windwalker Monk. I'll probably also try to tank as a Brewmaster. I'm curious to know why you think it's ridiculous. Personally, I'll probably be playing Mistweaver mostly. I'm kind of fed up with melee DPS, and the healing looks quite fun. Healing first, tanking second. But I'll obviously play whatever the guild wants me to play. Brewmaster is the way! Think Tank! 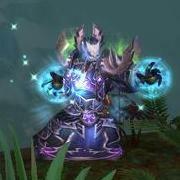 My Monk will be my 7th max level healer (4 priests, shaman, druid and Paladin so far) so will definitely be Mistweaver main spec. Wait what? 4 Priest healers? Why? I'm not sure if I can be bothered to level another Alt. I'll probably change my tune once the expansion comes out. I'll go MS tank and OS heals. I will go with Healing as MS and tanking as OS :) got enough dps already and very few healers so its time with a new healer! If I bother with a Monk, mostly likely a Mistweaver spec. I don't mind trying a brewmaster, though, looks pretty interesting. My monk Minju is going to be a healer..... healing is my thing in WoW, and I adore the way it played in beta. She will probably end up being my 2nd main, after my holy priest.